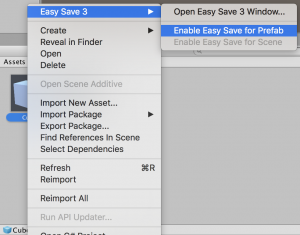 For information on saving and loading GameObjects without code, please see the Easy Save 3 Auto Save guide. // GameObject if one exists, or create a new GameObject if not. // Or we can choose what instance we load the data into. layer, tag, name and hideFlags. Components on the Natively-supported types list, or those which have been manually supported using an ES3Type. All of the above for every child of the GameObject. By right-clicking it and selecting Enable Easy Save for Prefab. You can save the instance using ES3.Save<GameObject>. To load, use ES3.Load<GameObject> or ES3.LoadInto<GameObject>. When loading, Easy Save will create an instance of the prefab if the instance we’re loading doesn’t already exist.